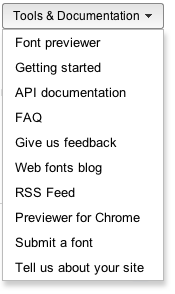 The directory pages now show a new dropdown menu at the top that takes you to our documentation pages, blog, previewer and other tools very quickly. Don’t forget to check out our new chrome extension as well. In the new navigation you will also find two new forms we have created for you. If you are a font designer and would like to see your font as part of the directory fill out our font submission form and tell us about it. 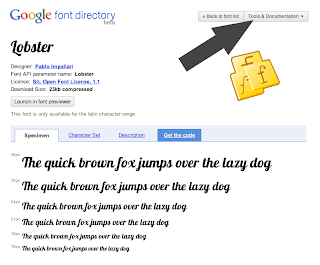 Have you created a website and used the Font API in a creative way? We would love to hear about that, too. We are working hard to improve our service and the directory. If you have any suggestions you can always give us feedback on our moderator page. To make it easier for you to navigate all the tools and documentation that are part of the Font API we have created a unified navigation for the directory.